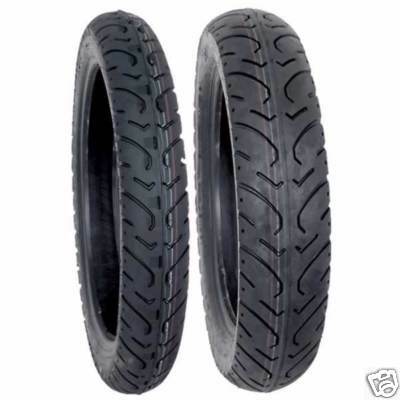 Our Kenda Motorcycle tires generally ship out within 1 business day! Excellent handling and wet weather traction. H-Rated for speeds up to 130 MPH. 6 Ply tube/tubeless carcass designed for high speed stability. Matching front/rear tread pattern for more responsive handling and cornering. Stiff sidewall provides better performance and handling. Matching front/rear tread pattern for more responsive handling and cornering but can be used independently. These have to be the best tires ever. Very easy to balance out, they feel like they have the firmest grip of any tires i have ever used and I've tried a lot. Better than Dunlop, Bridgestone and lots of others. i put them on my 83 Kawasaki KZ 440 LTD and while they are still new i am extremely happy with the ride both at very slow speed turns and high speed stability. Did i mention i got a matched set for the front and rear. Will post more after i get some wear on them. Had been using Metzler 880's and was disappointed how fast they were wearing out on my '95 Fat Boy so decided to try another brand. The Kenda was a little wider and I was worried that it wouldn't fit but it did and seems to be working fine so far. Have to put more miles on it to compare the wearibility but happy with it so far. I ordered a set of front/rear tires (130-90-16, & 140-90-16)on Tuesday evening at around 6 PM eastern time and they were at my door by 3 PM Thursday. PureOffRoad had the best prices of anywhere on the internet, and I looked around for a over a week. I haven't gotten them on my bike yet, but the service and shipping is impeccable! Thanks! I will gladly buy these again.These hold up very well. I really Love the tires,I bought two and have put over 5000 miles on them. They don't even look like they've been on the road a day !!!! I needed a pair of these tires but decided to buy only the rear to "test" out Pure Offroad. The tire was the best price I could find anywhere and it showed up on my door step in a couple days. I was so happy, I ordered the matching front tire immediately. Keep up the great service! A great big circle of AWESOME! These are just about the best tires that I have gotten for the price. Fairly good traction and a well made compound. I also received them within days and was up and running without missing much. I would recommend these tires and pure-offroad to anyone.... I may just pop the clutch at full throttle and buy another tire just because I can. Who knows? Great Tire Great Price Corners like a dream Prompt Shipping Will use Pure Offroad again !!! I have been ordering the kenda Challengers for a while now I do a lot of hard riding and have gone through a couple sets on a couple different bikes. I am very pleased with the customer service and the quality of these tires. I look forward to wearing out more tires and purchasing more from pureoffroad.com Thanks for keeping me on the road. I INSTALLED FRONT AND REAR CHALLENGER TIRES ON MY 1974 HONDA CB 400 F SUPER SPORT. THESE TIRES MADE A WORLD OF DIFFERENCE IN RIDE AND HANDLING COMPARED TO THE O.E.M. REPRODUCTION TIRES I WAS USING. THE KENDAS ARE ONE OF THE FEW MODERN TIRES IN SIZES TO FIT THIS BIKE AT A REASONABLE PRISE. I WILL BY THEM AGAIN AND FROM PURE OFF ROAD. EASY PURCHASE AND FAST SIPPING. Q: are these kenda challenger 657 the same for front or rear? are they interchangeable? A: No they are not interchangeable. They are specifically designed to be used as a front or a rear.